Does the local GM dealers have manuels to sell for overhauling the 4L80E? As soon as I get to my brohers place, I need to bring home my turbo 400. I got a TCI book from Summit. trex I down loaded that book just incase the one t have coming dorsn't have all the information. Can any one tell me who has the best clutches? My repair Manuel I ordered is here. trex....thanks very much for the link to that manual. Cool a lower first gear. That's the one I'm running in my truck. The only thing I'm having a problem with is I can't get the 2-3 shift smooth. It has a bit of a jerk. Not a real problem, but my wife has back problems and when it jerks it causes her some pain. I can't go fast with her in the truck. Without her in the truck it's just annoying. Thinking of shipping the trans back to the builder to have them check it out while I have my engine out. I put my 4L80E with that gearset in behind my old 5.3L, with the 4L60E it would break the tires loose if I floored it, but it was a near thing. With the 4L80E, I can almost break the tires loose. Well, except when I initially put it in and the pressures were all wrong and I was able to break the rear wheels loose with the 4L80E in all 4 gears. It was something else, a 4.8L that would spin the rear wheels at 80+MPH on the 3-4 shift and that is with an Eaton posi, 3.42 rear gears and 32 inch tall tires. Since the pressures have been adjusted, no more spinning. Jim, there's always going to be a slightly different feel to the 2-3 shift compared to the other gears in a 4L80/85-E. In all the other shifts you have heavy components being brought to a halt by the shift. 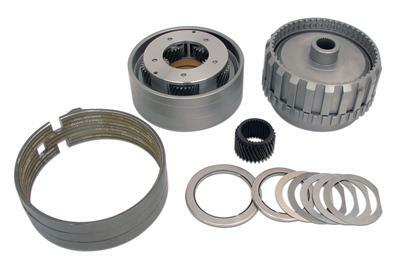 In the 2-3 the Direct clutch housing and sun shaft are brought into rotation by the application of the direct clutches. It takes some power to get all the heavy stuff up to speed, it's perceivable as a slight bog at low throttle. When i get the transmission, I will have to see what year it is. I know GM did up grades to the 4L80E just like they did with the 4L60E. A lower first gear is always nice when starting out with a load. I will have to see if this transmission is posible to add more clutches in certain clutch packs to give you surface area for torque. A shift kit will be necessary too. I have a turbo 400 I need to get from my brothers place. That transmission I had built. He put extra cluthes in it too. The tranfer case is a 243 electricshift. I will have to rebuild it too because of the mileage. Plus change the input shaft to the 32 spline shaft. It's not a feel thing, and it's not right. I've driven a stock 4L80E and the 2-3 on it felt correct. On mine, it feels correct with the current program when it's cold. When it warms up it starts banging the shift. I had to adjust the main drive table and pump the 1-2 and 3-4 shift pressures way up to compensate. It's like the fluid is too thin when it's warm, or there's a temp induced leak or something. You could have an internal leak. You can hook up a pressure gauge to see what your line pressure gets too low. There is a manuel on this post you can download. Then you can look through the trouble shooting part. It will show you where to hook up the pressure gauge. I don't see a specific 2 to 3 shift. Line pressure too high or low. Force Motor, Failed(off) or Loose connector. PCM loose connector. Accumulator, leaking or stuck. Incorrect accumulato spring. Checkballs, Missing. Calibration PROM, incorrect. Check the line pressure first. cold then operating temp. The accumulators have a lot to do with how the clutches apply and release. Hopefully someone else has a better Idea. I wish you could check the pressures to all the clutch packs to see if there is a leak. The power shift transmission on the farm tractors is this way. Thats why I talked my dad in to buying a crate motor vs. building one. The expense to do it one time couldn't be justified. There is no shame in farming it out if its going to be substantially less expensive than doing it just one time. Here's a couple of VERY handy links to building the 80E. Thanks Hquick. I just looked at all the pictures of the NP243 tranfercase rebuild. I found out today the transmission my friend has is a 4L60E. Just like what I have. I will look for one now. It would be nice to win the lottery. Then I could do what I want with my truck. It would be nice to get a duelly with the 454 and a 4L80E. Then I could put a duremax and allison in that truck. Dreaming again. If I do get a 4L80E and overhaul it, I will have to check with the Snap on dealer in Ponoka. He used to rebuild transmissions. Not too bad. I like having the Idea of a new pump. If the valve body has a lot of miles on it, then a new valve body would be a good Idea. You could get fine scrathes that could end up being internal leaks. Thanks for the posts.